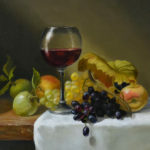 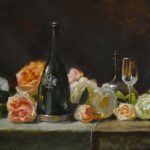 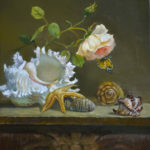 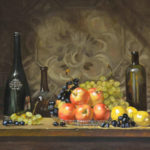 Raenell Doyle is committed to the beauty of classical still life painting and her compositions reflect a mastery of the classical element of light and shadow. 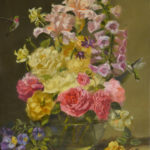 Flowers symbolize the fleeting nature of life, from buds and blooms to those that droop and wither. 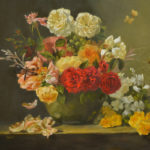 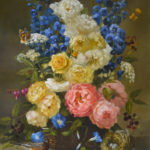 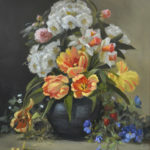 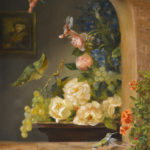 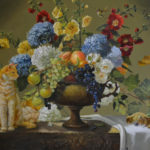 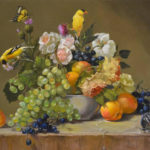 Always passionate about the classical style of Dutch floral painting, Raenell Doyle’s new compositions include a variety of birds and bird nests, spiders and their webs; colorful butterflies and other insects that light upon flowers. 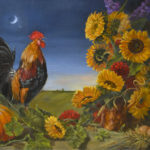 Doyle’s paintings are now quite animated with the creatures bringing the liveliness of the natural garden inside. 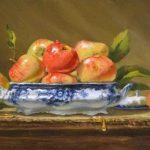 Combining a variety of hard surfaces like glass, metallic vessels, china and wood surfaces with the living forms of fruits, flowers and animals; she creates these intricate and sumptuous paintings. 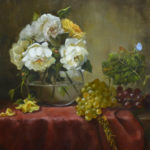 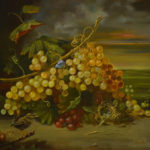 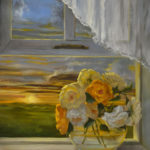 Doyle’s work has been recognized and exhibited in many Juried exhibitions: Salon International, International Museum of Contemporary Masters, OPA , National and Regional. 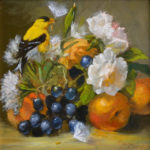 She is a Signature Member of American Women Artists.